Aventura is a camping experience in Ooty, where you stay under the stars and enjoy loads of activities and stunning views of the hills. If you want to have a holiday that isn’t your usual check-in to a hotel, take a quick tour, and explore the food and drink scene of a place, then this one's for you. Scattered across a few hills is the Aventura Camping site - An all out adventure and camping experience in Ooty. You get to stay in tents where the open skies are your only screen, and the sounds of nature are the only music you hear. Sounds perfect, right? 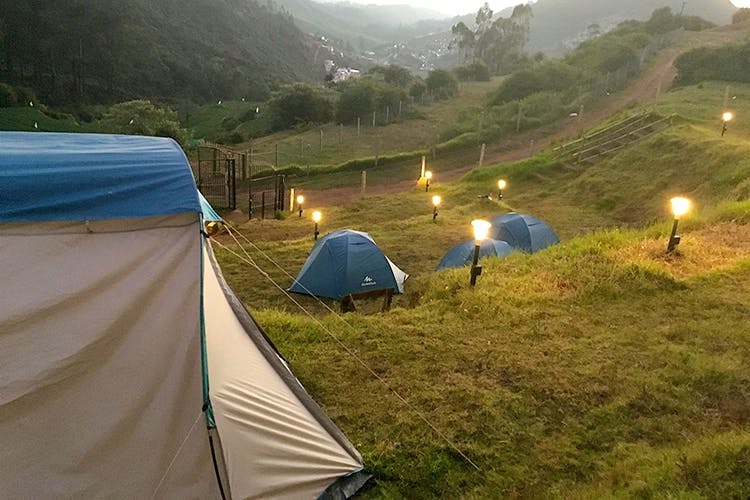 The tents are pitched on the hills, with lamp lit paths from a common area. There are two separate location for these camps — Tiger Hill, on the eastern side of Ooty, and Fern Hill. Depending on the size of your group, you can rent tents for two or four, which will be pitched, with sleeping bags and an air pillow. Not very far is the bathroom with hot water and a shower. The space is terraced, with each landing having activities like trampolines, sheesha and archery, and some have tents. The topmost terraces are sitting areas for you to enjoy the views and the reception and coffee shop are located on one terrace. The coffee shop only offers Maggi, tea, coffee, cool drinks and biscuits, but for something more substantial, Aventura will order for you. Of course you can go out for a bite to one of the good places to eat in Ooty, like the Clifftop International Cuisine, for their North Indian selection or the Culinarium, for their continental food, killer views and pot pies. If you're bringing something from home, there's a fridge to store your beers and a microwave as well. If you want to stay at camp, the reception and coffee shop area has a TV by the bonfire! Or you could curl up with a book (or bring out the camera) and lose yourself in the beauty of the site. In addition to just warming up around a bonfire, cycling, trekking, horse riding, karaoke and air rifle shooting are activities you can sign up for when here. You could even go visit a eucalyptus oil factory! Rent two-wheelers at the foot of the hill and ride around town if you're in the mood to explore. They don't have WiFi, and most phone networks may not work up their usual speed as expected.